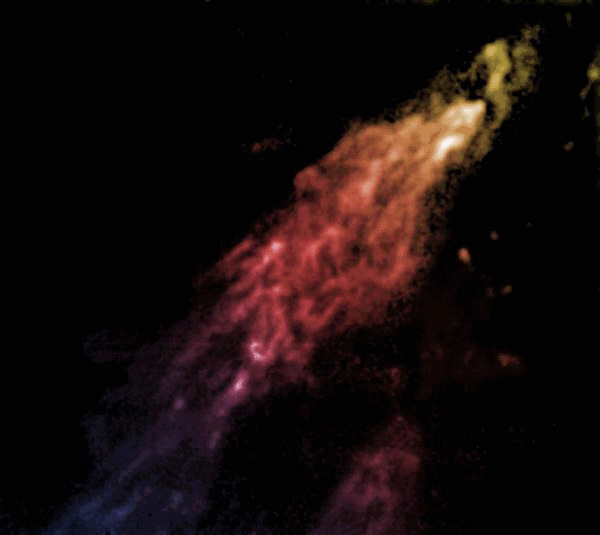 Radio image of Smith's Cloud from the Green Bank Telescope. Credit: Bill Saxton/NRAO/AUI/NSF. 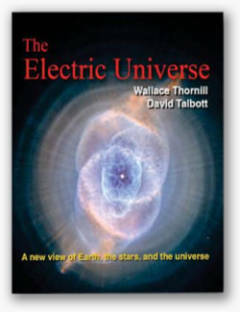 In an Electric Universe, it stands to reason that some galaxies will not be energetic enough for stars to form. A recent press release announced that a cloud of hydrogen gas known as Smith's Cloud, massive enough to be considered a galaxy itself, may have collided with our own Milky Way galaxy at some time in the past. According to an analysis of its trajectory, it is again on a collision course with one of our galaxy's spiral arms. Another dark galaxy example is VIRGOHI 21. It does not shine in visible light—no stars are there—but hydrogen gas glows in radio waves, so its existence was revealed when a chance scan by the Arecibo Observatory saw it. So-called "dark galaxies" are apparent evidence for dark matter, since their radiation profiles do not show high enough emissions of electromagnetic energy. Since Zwicky's Coma Cluster calculations in the 1930s seemed to indicate the galaxy cluster contained 400 times too little luminous matter for it to hold together, dark matter has been used to explain almost every galactic anomaly. How does gravity bind the edges of galaxies into a disk? They should be denser at the core and then gradually fade into wispy boundaries, yet many have rims of tightly knit stars and gas. Some have coherent structures like arms or bars that also exhibit almost solid-looking borders. How can galaxies spin so fast without flying apart? The only alternative that is offered in the scientific press is that gravity acts differently as conditions change. No mention of electricity and its powerful fields and forces. Only dark matter is allowed to account for the "mysterious" observations, or a bending of sacred gravitational formulae is invoked. "From looking at how galaxies rotate, we know that dark matter must be present, as otherwise these gigantic structures would just dissolve," said an astronomer employed by the Very Large Telescope array in Paranal, Chile. However, laboratory experiments and particle-in-cell simulations run on advanced supercomputers have shown that both the structure and angular momentum of galaxies are predictable results when plasma interactions are considered. If electricity and its attractive force 39 orders of magnitude greater than gravity were taken into account, the need for ad hoc addenda to gravity models would be unnecessary. It is not the galaxies but the theory that would "just dissolve" if the data was considered objectively. The electric currents streaming through the radio clouds are in "dark mode" and are invisible, like dark matter. Unlike dark matter, dark mode currents, otherwise known as Birkeland currents, can be initiated in a laboratory. Dark currents are an energetic source of microwave (radio wave) radiation. From what we can see of the Universe, most of the time the Birkeland current filaments flowing through ionized clouds of hydrogen create z-pinch effects and other plasma instabilities. 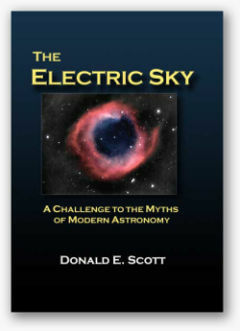 Stars (isodense balls of slow-motion lightning) form along them. Since the power for each galaxy comes from electricity flowing through great circuits in space, sometimes the levels are too low for glow mode or arc mode discharges to occur. If that is so, the galaxy will remain dark with a chance for a brighter future.